Despite the fact that amber is not a gemstone, since ancient times it serves as an amulet and ornament. In ancient times, he attributed the miraculous properties and the ability to heal many diseases. Unfortunately, today there are a lot of fakes of this gem. How to choose genuine amber, not cheap useless fake? Look closely at amber. You should know that in fakes, as a rule, are present in abundance air bubbles, and the color of the product uniform throughout its length. Natural gem, especially if it is not subjected to heat treatment, has an interesting color transitions between shades. Weigh the piece of amber. 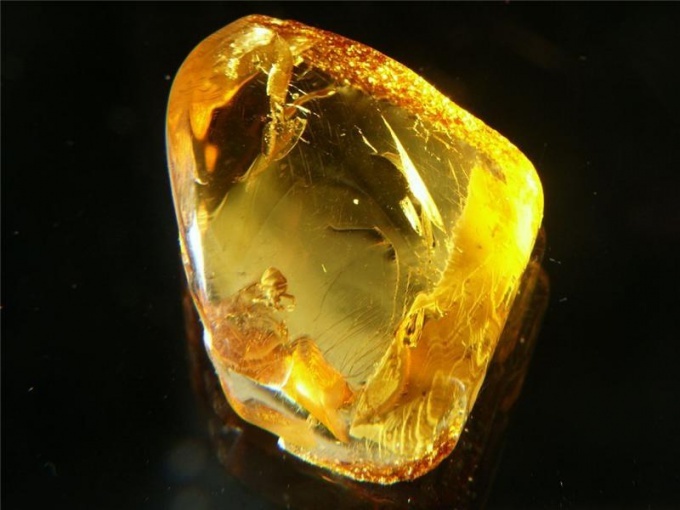 Amber is one of the lightest semi-precious stones. The weight of large amber beads may only be 50 g. Glass and plastic imitation much harder. Besides, it feels colder than natural stone. RUB the piece of amber on cloth. Natural stone in this case becomes negatively charged and begins to attract finely cut paper or a hair. If the electrification happens, before you fake. Attach to the surface of the stone a red-hot needle. If you felt a specific smell of rosin is a natural gem. The sharp smell of burning plastic will point you to the artificial origin of the "stone". Also be aware that when involved in a fire , the amber comes on for three seconds and continues to burn strong flame after it recovered from the fire. Make a saline solution. To do this, dissolve in a glass of water 10 teaspoons of salt. Immerse amber in the liquid. Natural stone will float to the surface, the forgery will lie on the bottom of the glass. Be sure to rinse the gem in running water after this experiment, otherwise it produces a salt crust. Cut a small strip of the products from behind or just in an inconspicuous place. It is recommended to do this with a sharp knife or razor. Natural stone will slightly crumble. Artificial likely to srazhatsya soft shavings. If you see in amber is quite a modern fly can be assured of forging.